Something we don’t talk about often enough. impossible to be ok all the time! good one! Aw hang in there you lovable Giraffe! Yes, I totally believe in this!! Thanks very much :) Definitely an important message. Perfect for me today! I saw your reblog after I posted mine. Thanks for sharing Incidental Scribe! These awesome pieces of art deserve a bagillion likes! Another remarkable work! I love it!! Perfect. I need this on my wall. More than that… sometimes it would be really unhealthy if you weren’t ok. I think some people are so convinced that they should feel great all the time, that when they don’t, they think they are alone and that makes the not-ok feel even worse than it should. Nice to be reminded it’s normal …..even if you feel its is just you. Sometimes all you need is someone there alongside you. Sometimes this one little sentence already helps to feel better. I think it´s a lot about accepting and letting it be… Very cute and lovely picture! I’ve been having a bit of a bad few days due to stress and worry, but I saw this and it made be feel a little better so I thought I’d share it. Hey. Thanks for your post today. A technical question- what materials do you use for your drawings? Are they hand drawn or digital? Thanks. Keep up the good work. Paul. Hi Paul :) Mine are hand drawn/painted (pencils, watercolours, markers), scanned and then edited digitally to make the colours look better on screen. Thanks! This is message is perfect timing for me! Thank you! Thank you, I’m glad you like it!! The best thing we can do for each other is this ideal: making it OK to show you’re not OK. Then we can help make it better, together. I love this! We need to remind ourselves of this more often. 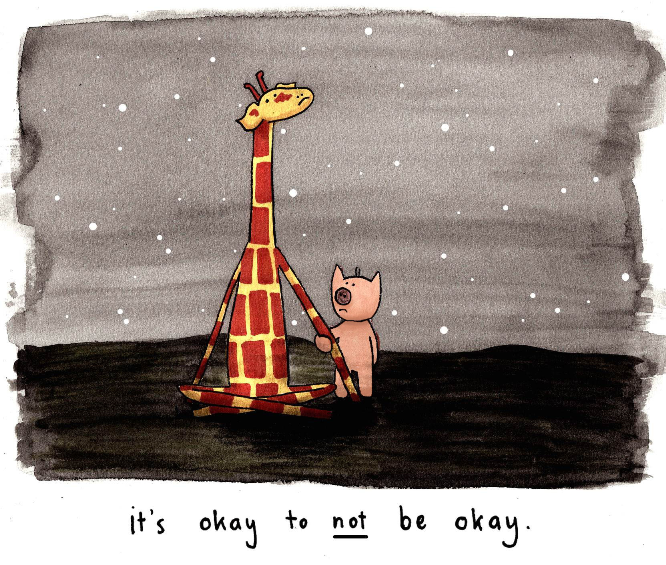 It’s okay to not be okay. AND it’s okay to do things at your own pace, no matter how slow.